“Artists From Cracow. Generation 1970-1979 MOCAK”, the exhibition curated by Monika Kozioł and Delfina Jałowik has opened on 19th of October, 2017 at the MOCAK Museum of Contemporary Arts in Cracow. I’m happy to announce that I’m taking part in this art show with the artworks from “Anastasia”. It is not the first time comics has entered the Museum, however it is the first time in Poland that you can see the complete comic album, all of the original pages (88 + cover, front and back), painted with acrylics on canvas textured paper. Each of the pages is 35,5 x 25,5 cm size and they are presented as a linear sequence. 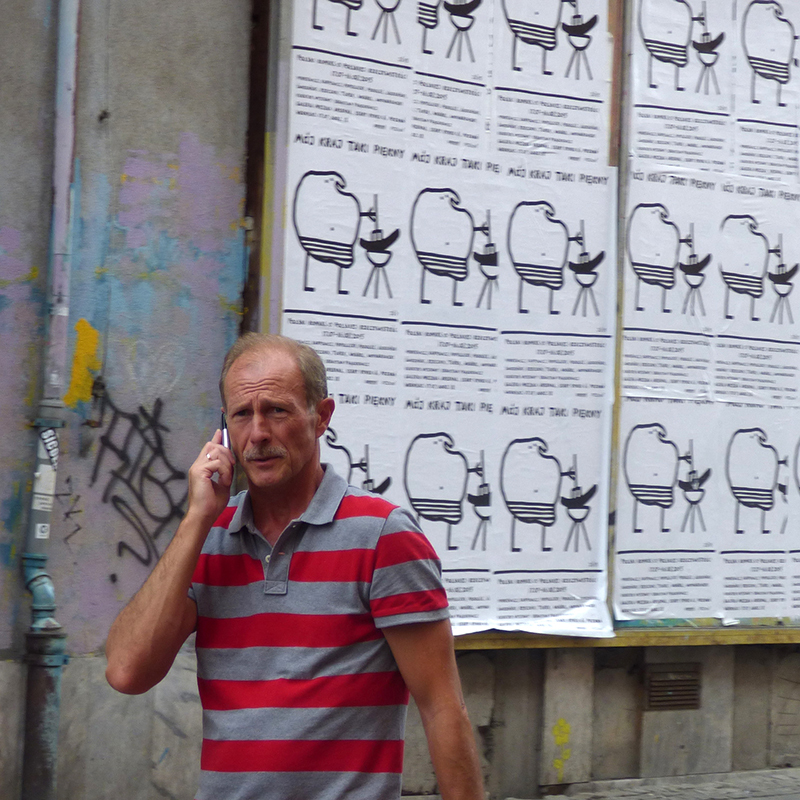 I’m gratefull to the Curators, who were determined to “go with the comics” into the project. My comic frames are not my different from my works on canvas – the difference is the size and the message. In the series of presentations Artists from Krakow we address the artistic legend of the city, blessed since the mid-nineteenth century with many outstanding talents. Krakow has been famous for its many firsts – the first academy of fine arts in Poland (1818), the first national museum (1879) and the first Institute of Art History in the country (1882). The city is synonymous with culture, which today is Krakow’s main industry. 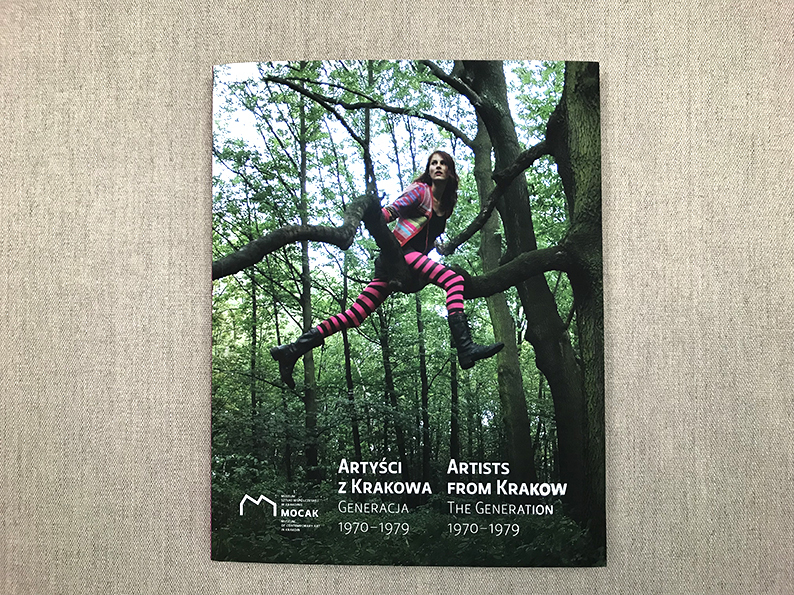 Artists from Krakow: Generation 1970–1979 is the second in our biennial series, in which we show the most important trends in Krakow’s contemporary art. The first edition concerned artists born between 1980 and 1990. The artists presented in the current exhibition graduated at the turn of the 20th century. The majority are familiar on the international art circuit and some are lecturers at art academies. The works on display have not been selected to follow a theme or any particular medium. As it turns out, painting, objects and installations dominate. Comics, photography and performance also make an appearance. The works of many artists have clearly been inspired by film, the visual arts and literature, but also by social and political issues. Female artists especially tend to critically relate their art to everyday reality, offering new visions of a better one and highlighting current social ills. There are also contemplative works and others that are outliers taking human emotions and inner states into the realm of nature or abstraction. Rafał Borcz, Rafał Bujnowski, Iwona Demko, Monika Drożyńska, Roman Dziadkiewicz, Arti Grabowski, Joanna Karpowicz, Ziemowit Kmieć, Karolina Kowalska, Przemek Krzakiewicz, Paweł Książek, Marcin Maciejowski, Cecylia Malik, Małgorzata Markiewicz, Bartek Materka, Kinga Nowak, Joanna Pawlik, Wilhelm Sasnal, Beata Stankiewicz, Witold Stelmachniewicz, Maria Wasilewska. 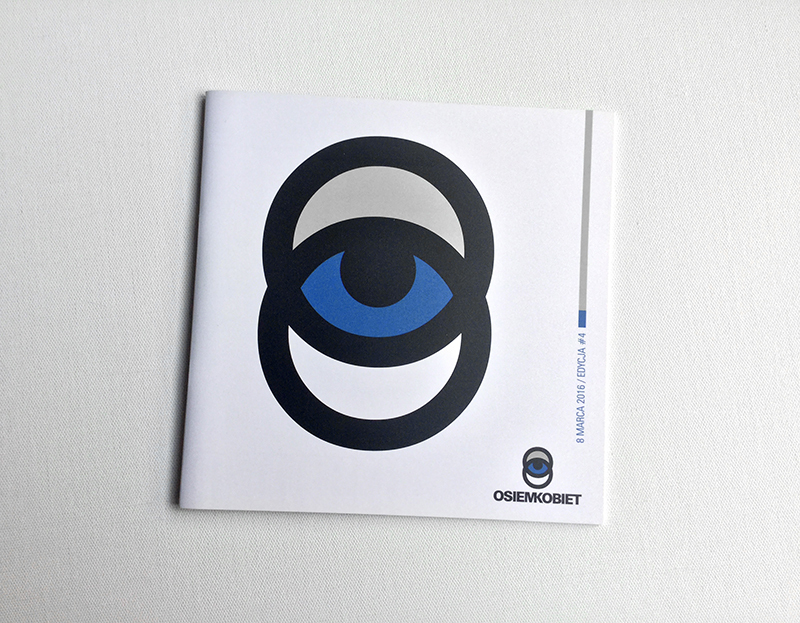 Read more about The Polish and English publication accompanying the exhibition. The exhibition will last till 1st of April 2018. There are things that are not for sale. Friendship, moments of joy and some artworks. Those you can only keep or share. I’m proud that one of my artworks became part of the collection at Museum of the History of Polish Jews POLIN (Muzeum Historii Żydów Polskich POLIN). It was presented as a part of temporary exhibition “Blood. Uniting and Diving”. BIG THANKS to ArtKomiks & Marek Kasperski for making it happen and to Borys Lankosz, who directed “Ziarno prawdy” and inspired this artwork. The exhibition Blood: Uniting & Dividing will open at POLIN Museum on 13 October 2017 and will be available for viewing until 29 January 2018. 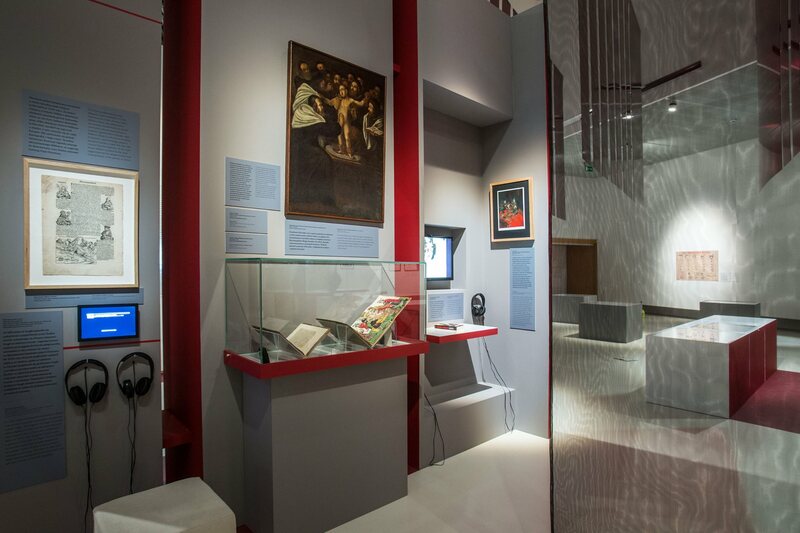 It has been inspired by the exhibition at Jewish Museum London dedicated to the meaning of blood in Jewish culture. 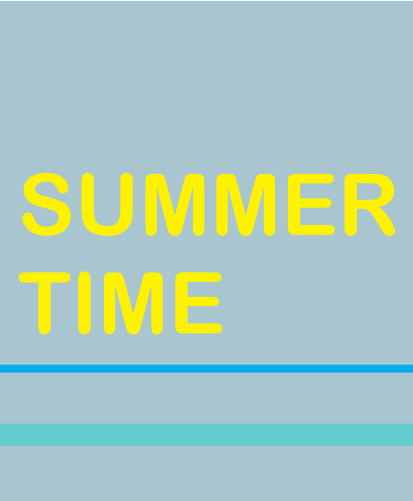 The Polish edition will develop the threads which emerged in London, enriching them with new ideas and objects. The exhibition narrative will be interspersed with contemporary artworks, among them the work by Anish Kapoor, one of the most globally renowned artists, presented in Poland for the first time. “Grain of Truth”, after the painting by Karol de Prevot from the Cathedral in Sandomierz, 24 x 32 cm, acrylic / paper, 2015. UPDATE: now you can take a walk and pay a virtual visit to the exhibition. I highly recommend it as it is well done! I just got a lovely package from Agata Napiórska (Zwykłe Życie magazine)! 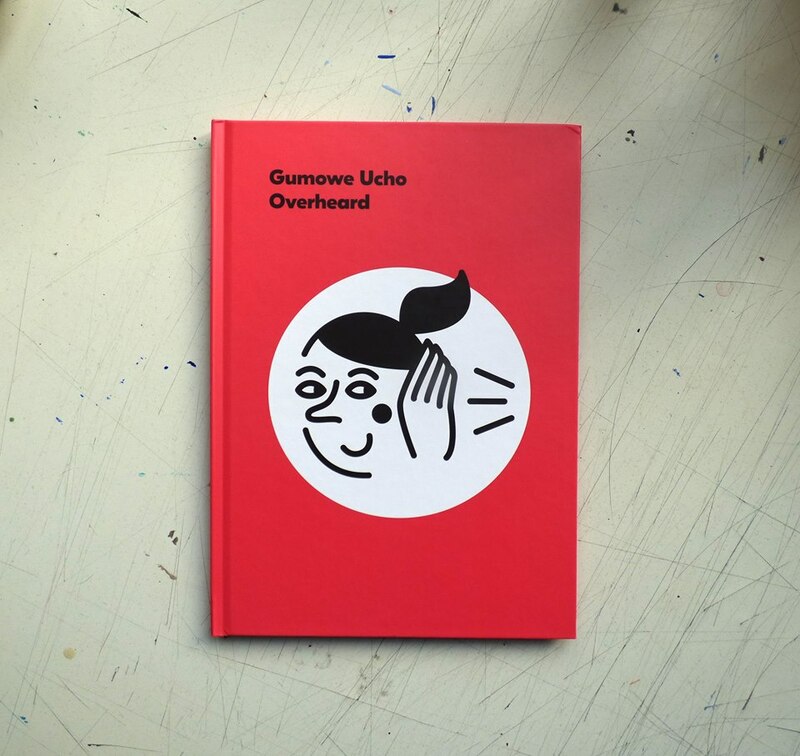 Inside – a sweet catalogue from the exhibition entitled “Overheard / Gumowe ucho” that took place in Art Something Gallery (Stockholm, 21st of April – 5th of May, 2017). I’m super proud my work is included in this project. You can also see it printed in a local magazine. My cat approves~! After I’ve finished my work on the first part of “Anastasia”, comic book written by Magdalena Lankosz, my head was still filled up with pictures of Old Hollywood. All the glamour, youth, beauty but also solitude, sadness was still there – waiting to be painted on canvas. Joanna Karpowicz, Cigarette Break, 100 x 120 cm, acrylic on canvas, 2017. “L.A.Woman” exhibition, curated by Janina Górka-Czarnecka and Dominika Czarnecka at the Gallery of Art Artemis in Cracow presents a choice of paintings inspired by Golden Era of Hollywood and vibrant light of Los Angeles. The adventure in Los Angeles began with a search for History with capital H. After all, every place must be marked by History. The continuity would give me, a reporter from Europe, a feeling of peace. But I found no History in this city that existed a mere 150 years. Instead of that, I was attacked from beneath every stone, from behind every doorway with millions of stories – histories with small h. Who did not with whom, how and where. Gossip, legend, elliptical statement, the police chronicle and the indescreet society column in the City of Angels have taken on the taste and importance of a chronicle, testimony and story of the greatest import. Joanna Karpowicz, Great View, 80 x 100 cm, acrylic on canvas, 2017. At the beginning of the last century, it was all restless spirits – gold seekers, thieves and dreamers – who flocked to California. All of those who chafed at the corset of norms and principles. They came to reinvent themselves and they invented something that captured the hearts of people all over the planet. In a decade, they built the film industry and made it the fifth-largest sector in the American economy. The only one that was not affected by the Great Depression. It turned out that the pursuit of invention is an instinct stronger than fear of the world coming to an end. In Los Angeles, nothing is completely real, but neither is it totaly unreal. This city is a potential existence waiting to be filled in with a story. Self creation has been made into an art form there. Inventing oneself has become the highest form of existence. The Old Continent voted “post truth” as the word of the year for 2016. The City of Angels has built its foundations from little bricks of post-truth. Joanna Karpowicz, Tunnel, 60 x 70 cm, acrylic on canvas, 2017. It was a fascination with the fact that in Hollywood, the borders are blurred between fiction and reality not only on the screen, and every life there is only a potential story, that gave birth to a comic strip entitled Anastasia, the script to which I wrote for Joanna Karpowicz. In it, we tell the story of a girl who comes to LA in the times when Hollywood is at its most powerfull and dark. The great screen stars, treated by audiences as deities walking about the Earth, are blank sheets of paper for producers to cover with writing and use at will. Joanna Karpowicz, Primavera, 93 x 65 cm, acrylic on canvas. We were fascinated with a world in which CVs are invented over a glass of wine, and marriages are contracted to promote a film. We sought the tracks of those whom the city’s vampire had devoured, and those whom it gave eternal life. We looked through hundreds of photos. And it did not cease to fascinate us what is hidden behind the smiles of the people they present. Perhaps the most overwhelming loneliness in the world, about which Jim Morisson sang in “LA Woman”. Joanna Karpowicz, Electricity, 100 x 120 cm, acrylic on canvas, 2017. In her pictures, Joanna Karpowicz utilizes the narrative potential of the City of Angels. She looks beneath the top layer of the story to get at the one that emerges from beneath of it. She captures the ordinary extraordinainess of Los Angeles, its charm, its paradoxes. Does she arrive at the truth about this place? She arrives at something more important. To an awareness that in this strange place, truth is of no significance. What counts is a good story. Each of Joanna’s pictures is a good story. She and the City of Angels are made for each other. 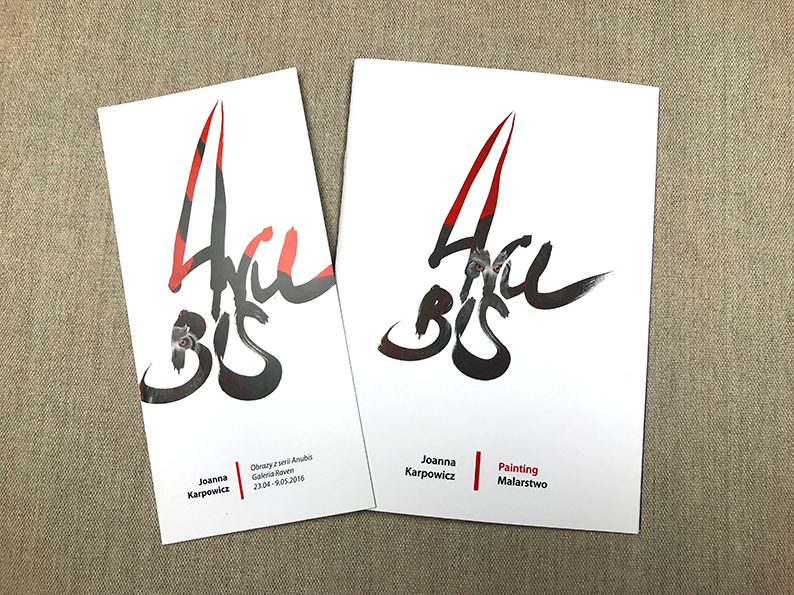 Special thanks to the sponsors of the catalogue: Aneta Niciak from Kando Plus, Allan Veiga, Kjetil Galleberg from Galleri Galleberg (Norway) and Grzegorz Wilkosz. Beautiful, mysterious, famous – Gaja Grzegorzewska, novelist and adventurer visited the exhibition at Artemis Gallery (Poselska 15, Kraków). 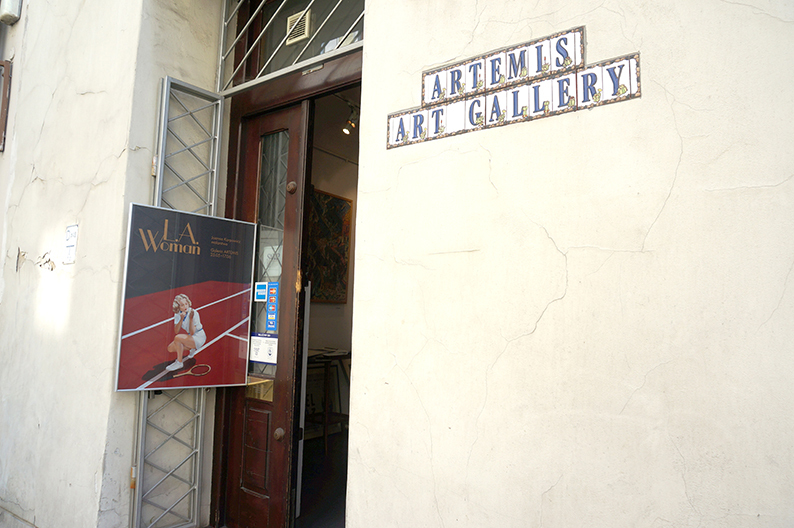 LA Woman” painting exhibition has officially started at Artemis Art Gallery in Cracow. Thank you all, who came to the opening! It was so good to have you there. Thank you Magdalena Lankosz for a great speach and text in the catalogue. Big thanks to my friends from Norway, Allan Veiga (artist/painter) and Kjetil Galleberg (Galleberg Gallery), who made me an awesome surprise with their presence! I love you guys! If you want to find out more about LA Woman read this post. The cover of Martim Monitz vinyl LP was chosen for the exhibition in 30 /30 competition. Good to be amongst the best vinyl covers of 2016 – I consider it as a bit of a lucky accident, because I’m not a designer, just a humble painter / illustrator. And as you can see our cover is not “over designed”, haha. The covers were presented during the exhibition at Galeria Arsenał in Poznan (21.04-24.05.2016) and during the International Trade Show in Poznan 2016. Three years after the first exhibition of “Anubis” series (Galeria Łącznik in Cracow, 2013) I got a chance of presenting new “Anubises”. This time at Raven Gallery, also in my home town. The introduction for the catalogue was written by Sebastian Frąckiewicz, cultural journalist and critic specialising in comics. Is there more FEMININE subject than ROBOTS? I don’t think so. That is why I’m going to show them at the upcoming group exhibition at “Konduktorownia” in Częstochowa. It is a fourth edition of “Eight Women”, event organised by Regionalne Towarzystwo Zachęty Sztuk Pięknych. Beside my humble person you will also see there works of Barbara Gębczak, Ilona Herc, Maria Kiesner, Małgorzata Kosiec, Agnieszka Sandomierz, Viola Tycz and this tricky little genius, my sister, Katarzyna Karpowicz. The opening took place on 8th of March, 2016 – International Women’s Day, originally called International Working Women’s Day. Although in Poland it is more of a “show your love and affection for female” day, I still believe that the origins of this day are important and nothing stands in a way to combine a flower with some thinking about equity and women’s rights. As a woman I allready took part in a many COOL FEMININE PROJECTS. Don’t get me wrong – I love to participate. I just wish those were JUST COOL PROJECTS. I believe the day will come. “My country so beautiful” – Polish comics about Polish reality, a group exhibition at Galeria Arsenał (Poznan), curated by Sebastian Frąckiewicz, critic, journalist and writer. As a part of exhibition we presented “Tryptych of Bałuty”, short story written by Robert Popielecki. Sebastian’s idea was to take comics out of frames, out of 2Dimensional tradition. Due to his original approach comics upgraded into an objects of art. Our comic was transformed into an improvized altar / flee market site. Fun! And an important lesson to all of those who still trouble themself with a question: “comics – art or not art?”. 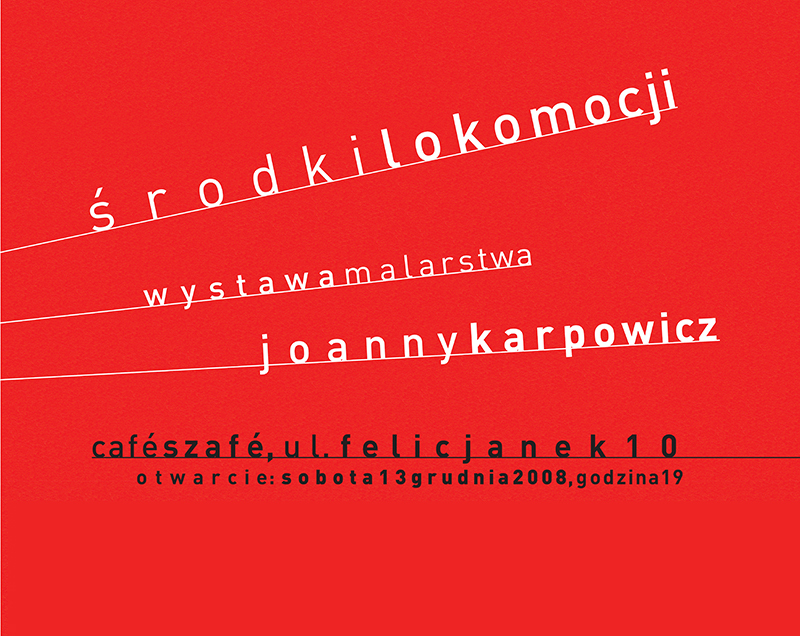 Poster designed by Diana Gawronkiewicz. My Mother met my Father at the Academy of Fine Arts in Cracow in 1973. They were both beginning studies at the Painting Department. The times were harsh. Communism had changed every day life into struggle. Both of them came from the homes with quite modest material status, yet – all the wanted, all they craved was to make art. So they did. Anna Karpowicz (nee Wiejak) and Sławomir Karpowicz. The atelier of Jan Szancenbach, open minded, demanding, but supportive Professor, was a good environment for the young couple to develop their skills and talent. Also, it was a friendly environment to welcome the new member of the family – me. I was born in 1976. In 1978 all three of us graduated with MA degree. In 1985 my Sister, Katarzyna Karpowicz was born. Our home was filled up with an artistic atmosphere. Artists of all kinds – painters, musicians, writers were visiting us almost every day. Not all of the talks, chats, monologues, songs were ABOUT the art, but most of it WAS art. My Sister, who from the early childhood was an art prodigy, was actively engaging in a creative interactions with our guests. This super intelligent and talented little girl could draw and paint almost anything and she was not hesitating to defend her artistic stand. While Kasia was soaking the artistic vibe, I was very often tired of it, badly craving a contact with “normal people”. But to both of us, just having a pile of blank pages and some pencils was the biggest joy. Painting, drawing was like breathing. My Sister, to these days, often underlines this almost physiological connection that artists have with painting. Most of our childhood and teenage years we lived in the studio rented from the Academy of Fine Arts. It was a place with the history. It used to belong to Olga Boznańska. From the windows of her big, greenhouse like atelier and small kitchen we could see the view that did not change much since Olga’s times. You could feel her spirit there. We were lucky to observe both of our Parents working. Many of becoming artists, after finishing studies has only a vague idea how the real life of an artist looks like. They need to work out certain things for themselves. We could see that in practice. Being a painter requires a great devotion to your work, it involves you 24/7. You simply never stop being a painter. It gives you a rewarding feeling of satisfaction, but also guarantees a lack of financial stability. We could also observe how different can two painters can be in their artistic temper, way of work. Our father after graduation became an assistant of Jan Szancenbach, (later – a professor himself). He was sharing his life between the atelier and the Academy. Our Mother stayed at home with us – but her passion for painting and hard working attitude allowed her to create and take care of two children, at the same time. It wasn’t easy. Relationships can be hard, relationships between the artists – even harder. Yet they were the best friends and in a way, artistic soul mates. My Father died in 2001, at the age of 49, cancer. So, me and my Sis we knew what we get into when we decided about our life career. I got my own MA degree in 2001, my Sister – 9 years later. We both studied at the atelier of Leszek Misiak, Painting Department. All of us chose the path of art. It surprises some people, but to us seems to be a natural choice. 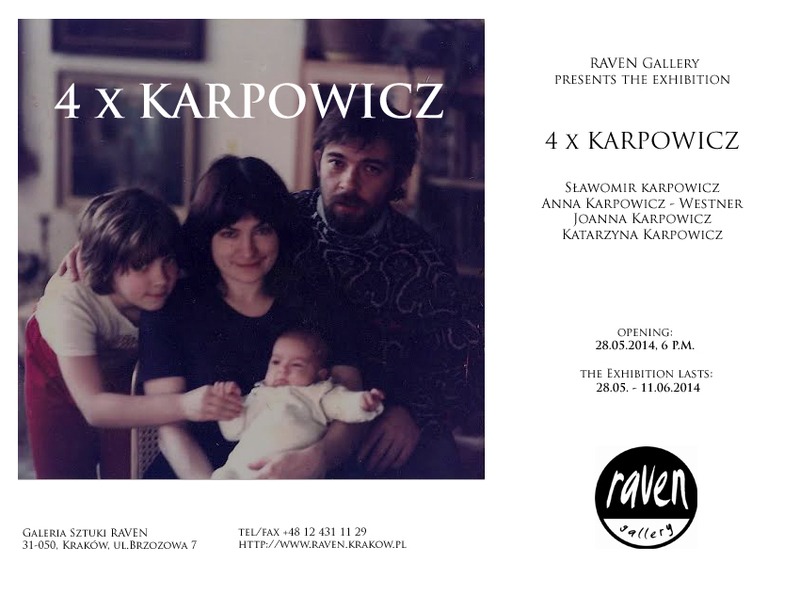 On 28th of May, a friendly space of Raven Gallery (Cracow) hosted a small family exhibition: “4xKarpowicz”. Each of us showed a choice of recent pictures, we also chose some of the works of our Father, including those never exhibited before. Here is a few photos from the exhibition. You can see more of my mother, Anna Karpowicz – Westner works here. And more of my sister, Katarzyna Karpowicz works here. We want to thank you once more for your generous contribution towards the #CharacterSelfie project. We are only able to present a very small fraction of all entries, and are very honored to herewith let you know that your CharacterSelfie will be part of the central installation within our anniversary exhibition! 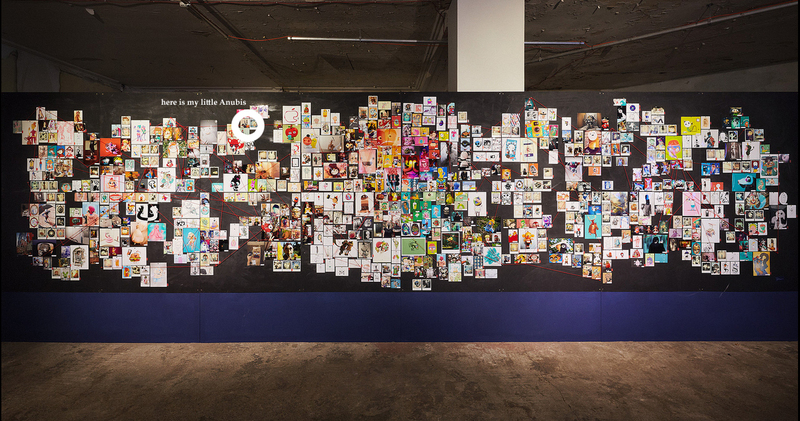 A massive “wall of crazy”, longing to bring order to the overwhelming chaos of character narcism and trying to trace social connections between the diverse portraits will present your artwork amongst the 500 best entries as unique photographic prints, providing full credit to each artist. 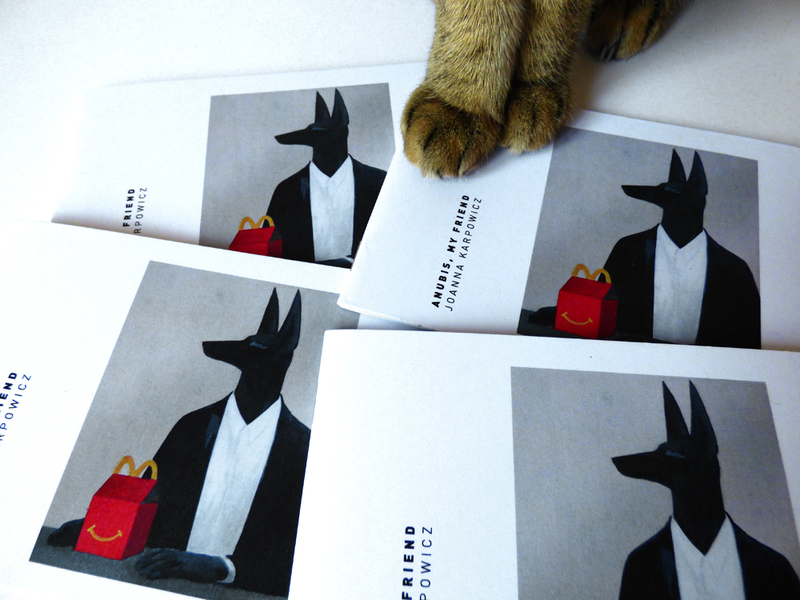 Anubis Selfie, in a honorable company of Friends & Monsters, was first presented in Berlin, Kaufhaus Jandorf (during the PICTOPLASMA FESTIVAL 2014, 1-11th of May). Then from September 2014 to January 2015 the Pictoplasma Portrait Gallery was presented as part of an extensive Pictoplasma exhibition in the Museum for Contemporary Art MARCO in Monterrey, Mexico. To celebrate its 10th anniversary, Pictoplasma is staging a vast group exhibition that brings together new works by the 100+ international artists, designers, illustrators, and filmmakers who have most influenced the project over the years. Funded by the German Federal Cultural Foundation, the Pictoplasma Portrait Gallery examines the genealogical dimensions of figurative aesthetics in the postdigital age. The installation is part of Pictoplasma’s ongoing investigation into the limits of face creation and animism. What are the minimum requirements needed for something to pass as a face and at the same time arouse maximum empathy in the viewer. The unifying format of the portrait has been chosen for a reason: even its classical manifestation portraiture has always been less about recreating a person’s appearance than bringing out their true personality as they “look back” at the viewer from inside the image. At the same time the genre has undergone constant change, through first analogue and then digital photography. The exhibition presents paintings, busts, sculptures, animated video portraits by today’s most influential creators of character-driven visuals – also extending this list to accommodate the current obsession with self-portraits taken on a cellphone, gathered by Pictoplasma in an open call for #CharacterSelfies. Strange Stories / Young Polish Narrative Painting, a group exhibition curated by Galeria Stalowa from Warsaw. First it was presented in Warsaw, (April, 2014), then, a month after in MENO FORMA Gallery (Kaunas, Lithuania). 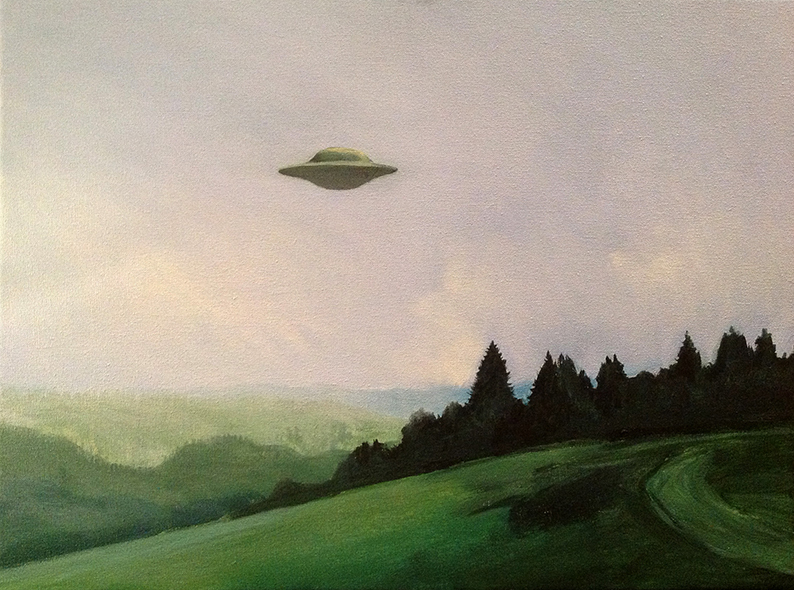 You can see some of my paintings from “Sci-fi / Robots” series there. And here is a catalogue of the exhibition, with an interesting introductory word by Krzysztof Stanisławski. First individual exhibition presenting Anubis – the series of paintings. 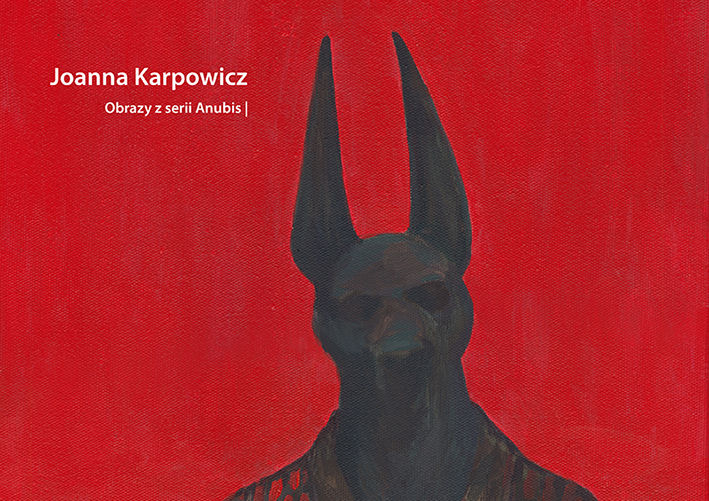 A project, entitled “Anubis, my friend” was curated by Ewa Kawecka, the owner and animator of Galeria Łącznik. The opening took place on April, 2013. 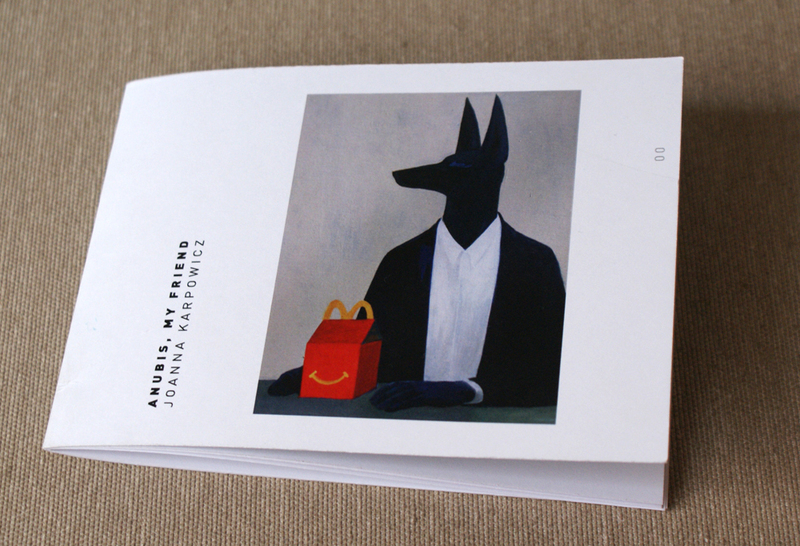 The exhibition was accompanied with a little booklet, published by Centrala / Picture Book. Anubis, the jackal-headed funerary-deity is associated with the process of transition towards the afterlife. Ancient Egyptians called him Anapa or He who is upon his mountain. In the times of the Old Kingdom he was the most important protector of the deceased and their tombs. Anubis is my friend, he helps me to tame my fears. At my canvas Anubis assumes many different roles in various contexts. One day he might be mine merciful and tender guide but for now he is sipping a coffee in a little place at the corner. He is a receptionist in a hotel, waiting for a late night guest to come. He is watching a movie, eating popcorn. He is rowing the boat on a river, giving the passengers a ride on the other side. He is traveling, constantly in a motion. He is going out, for a smoke. He is waiting at dusk in the garden near the sea. He is always there, for you. 23rd International Festival of Comic and Games in Lodz (PL) had started on 5th of October, 2012. As usually, ICGF was accompanied with a range of various exhibitions. 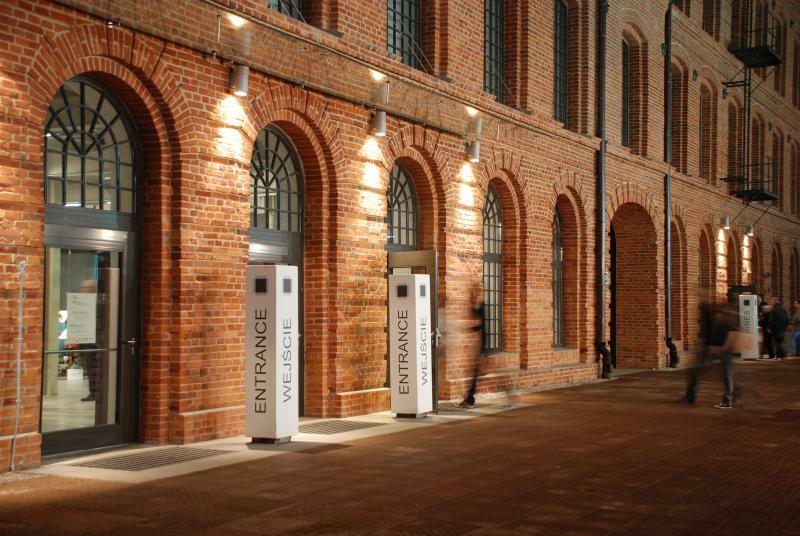 Big opening took place on 20th of September at the most awesome, restored industrial building of Central Museum of Textiles in Lodz (Piotrkowska Street 282). 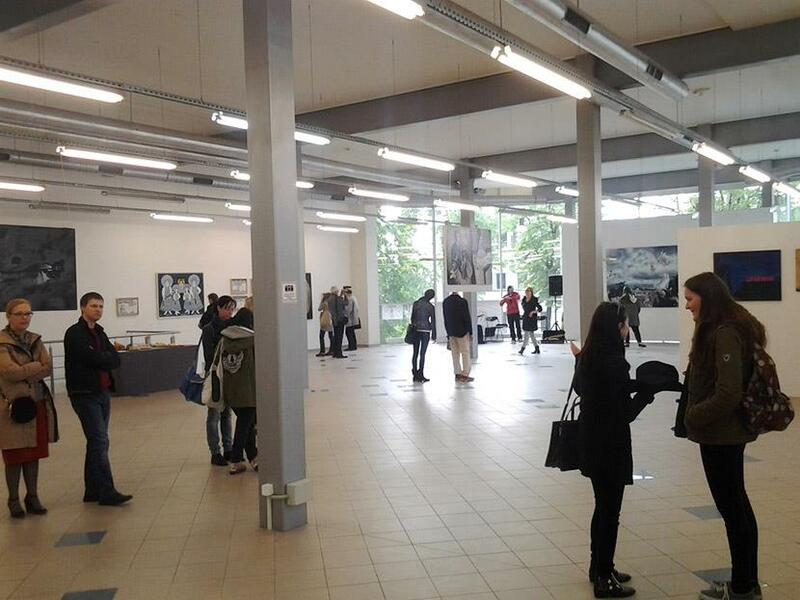 “Polish Female Comics” group exhibition was organized in the cooperation with Contur Creators Association. I decided to show original artwork, rough pages, no Photoshop – just to pay tribute to my favorite, “analog painting” technique: acrylic on canvas paper. A frame from “Safe Place”, short story presented at the exhibition. MOCAK, Museum of Contemporary Art in Cracow stands out on the background of more traditional, local art institutions. Maybe that’s why they dare to put comic works on their walls. “Comic. Urban Myths”, a group exhibition of five artists started on 17th of February, 2012 and finished on 49th of April, 2012. The works of Malgorzata Jabłońska, Agnieszka Piksa, Kuba Woynarowski, Mariusz Tarkawian and mine were presented in MOCAK’s Beta Gallery. 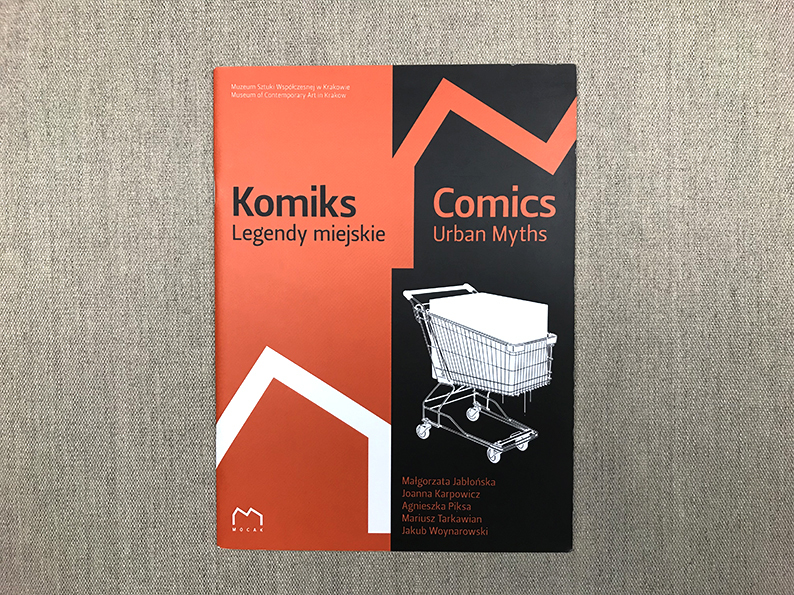 Here is how Monika Kozioł, the curator of the exhibition, speaks about the project: Urban myths are stories circulated by the Internet and other media as well as spread within social groups. They provoke strong emotional responses and inspire the passing on of the stories which thus become a hybrid gossip and acquire a life of their own . It isn’t always the case that urban myths are pure fiction. Some of the events in these stories really did happen or contain a grain of truth. The works shown at the exhibition are somehow related to the phenomenon of urban myths – the artists create brand new myths or transform existing ones. Urban myths describe disturbing and incredible events, which stem from common fears, and some of them are cautionary tales. All the works employ the technique of the comic strip, with its characteristic strong narrative quality. The main goal of the exhibition is to present various techniques which can be employed to create a comic strip (drawing, painting or installation) as well as to highlight the significance of the comics genre as an art discipline. 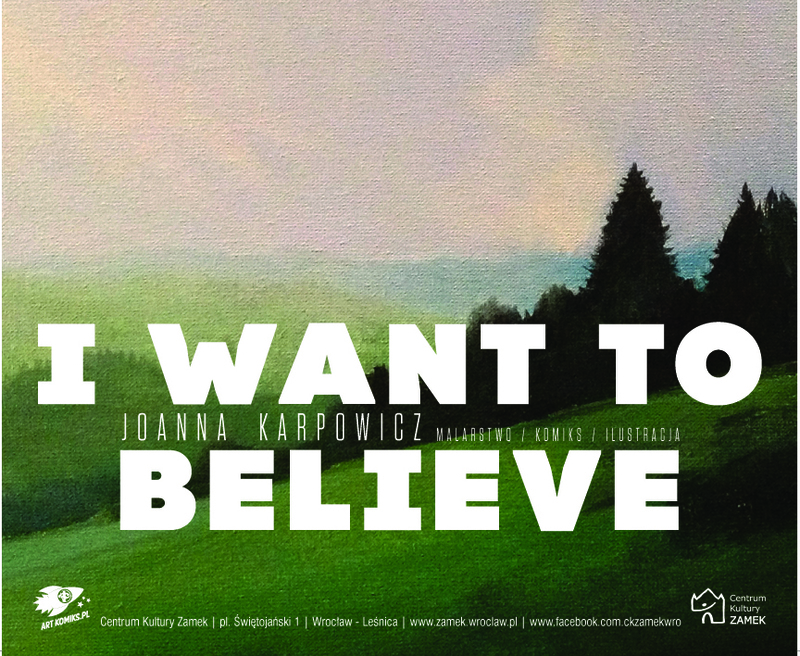 Once again, the curator, Monika Kozioł, this time about my pictures: We shall not find the most popular myths in the painitings by Joanna Karpowicz. The artist is interested in creating her own mythology. These include oneiric scenes from the nightlife of the metropolis or visions of a futuristic town, where the No. 15 tram soars the sky, serving people and animals on equal terms. In showing possible scenarios for the future, the artist tries to appease the fear of the unknown. Most of the paintings consist of three frames and are a part of longer story. This non commercial exhibiton leitmotive was: means of locomotion (hence, the title). All sorts of cars, trains, even a boat and a plane were depicted on the canvas. Unfortunatelly the photos from the opening are lost so I can not share, but it was crowdy. It was the last time I took a courage and presented my works in a place with shared function – it’s very hard to take cherry vodka off the paintings ;). But at that time of my life I was working in advertising full time so I was just happy I can show my works to people. Some of the paintings, presented at the exhibition. “Gangsta car”, 30 x 40 cm, acrylic on canvas, 2001. “Woods”, 50 x 60 cm, acrylic on canvas, 2008. Hotels were always my great fascination. Not because I’m so much into a hospitality business, but because each of them is a little universe, governed by its own rules. And every universe has its mysteries, well hidden from guest’s eyes. While entering a hotel lobby or a room we become a part of this universe, but we almost never go deeper. “Room 666”, my first individual painting exhibition was an attempt of portraying a hotel inner life. The exhibition took place at the Nova Gallery (Art Agenda Nova, on March 2003). 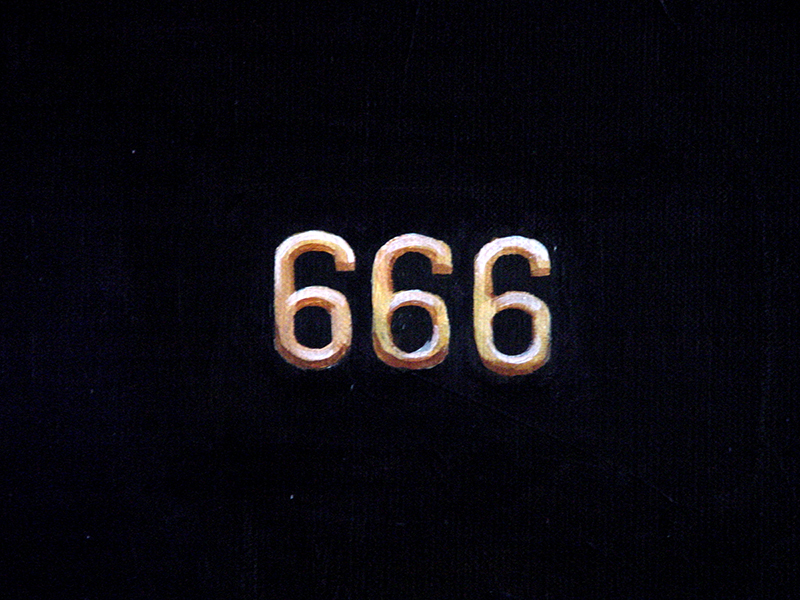 “Room 666”, 200 x 70 cm, 2003. Picture taken in the old atelier (old Olga Boznanska studio) on Piłsudskiego street, Cracow.